The standalone Report Designer of Telerik Report Server uses the latest UI standards to help you create and analyze interactive reports directly on your machine. Ready reports can be stored, shared via e-mail, managed with a variety of line-of-business capabilities, exported to any format and printed. 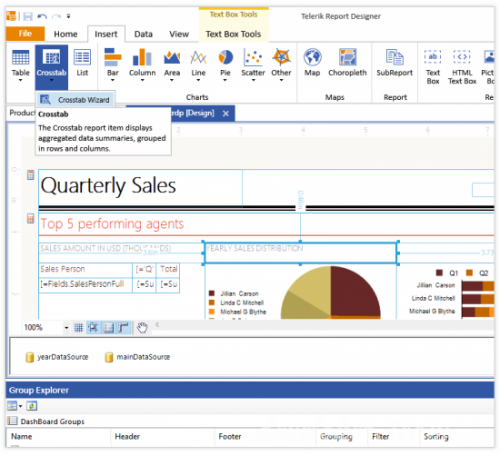 Telerik Report Server provides a WYSIWYG canvas in its standalone Report Designer. It simulates graph paper and implements techniques used in drawing software, such as gridlines, item snapping, item rotation and on-canvas item dimensions to simplify positioning and aligning report elements. Telerik Report Server Conditional Formatting uses a powerful reporting expression engine with data conditions to control text color, font and background, much like Microsoft Excel. Telerik Report Server provides an advanced styling mechanism which closely follows CSS specifications. The model provides quick yet detailed visual customization of all your report items. You have full control over the item’s properties. Styles can also be copied and applied to other items in a report. Add drill-down and drill-through actions to your reports, insert a document map to jump to a report section and add hyperlinks to external web pages. These interactive features are available in all report viewers and standalone report designer, powered by Telerik Reporting. The HTML5 report viewer also offers screen-optimized touch capabilities. Seamlessly connect to Telerik Report Server directly through the standalone Report Designer to upload new reports on the server or edit existing ones. Just fill in the Report Server location and your credentials. The report designer will also provide a list of the available server data connections and offer options for adding new ones. Boost your brand visibility with a fully developed, field-tested solution that’s updated regularly. Progress enables you to white label Report Server reports for the same price. Enhance the quality of your work and strengthen customer loyalty with a sophisticated, branded solution. Limit report access to registered users. Create and manage user roles with predefined permissions, add new licensed users and assign them to user roles, or set individual user permissions. Forms authentication is the currently supported provider. Telerik Report Server provides support for Active Directory Federation Service (AD FS) authentication provider, enabling your users to authenticate using their Windows domain or Azure AD credentials. The integration is quick, seamless and takes no longer than ten minutes to complete. You have full control in assigning roles, be it administrator or read-only. Schedule and automatically run reports stored on the Report Server, all at once or at regular intervals. Scheduled reports can be automatically delivered to your end users in PDF, Excel or HTML format via email, or saved locally for further reference. End users don’t need a license to receive reports, and there is no limit to the number of users who can receive reports, or the number of tasks you can schedule. Stay informed about the most pertinent report data, regardless of how much information you collect. Pre-defined data alerts and e-mail notifications help report users to stay aware of any changes in the reporting data. They can be run and used on a recurrent basis (daily, weekly, monthly, yearly). Deliver interactive reports directly to your business application (responsive HTML5, Angular and .NET web apps, Azure, WPF and WinForms desktop apps). View reports in one of the six supplied report viewers, where we guarantee a uniform look regardless of the platform. View your reports directly in SharePoint via the ASP.NET viewer and fully leverage the system’s advantages. No additional client access licenses are needed for viewing reports embedded in your application. The report viewer controls require Telerik Reporting or Telerik DevCraft Ultimate license. Telerik Report Server is a one-stop shop for advanced report management and enables you to store all reports in a single server-side repository. With a standalone web interface, Report Server also empowers you to load, view and deliver reports in the most user-friendly way. With Telerik Report Server, you are always protected from accidental mistakes when managing reports. Users can keep track of the different versions and revert to an older version, if needed. Built-in caching functionality leads to optimized memory consumption and helps multiple users load the same report faster. Telerik Report Server was built with responsiveness in mind. Whether accessed via phone, tablet or PC, the report preview will always provide a user experience tailored for the specific screen size. You can manage the available reports in any modern desktop browser. Get complete programmatic control over your reports. Use comprehensive APIs to create, modify and work with reports, sections and report items with code. Show your created reports in feature rich web preview. It allows all authorized server users to review, print and export the report content. Additionally, integrate the reports into your applications. Achieve this with the report viewer controls included in Telerik Reporting solution. You can get it as an individual product or take advantage of Telerik DevCraft Ultimate bundle which contains both Telerik Report Server and Telerik Reporting. When you are ready to print or export, switch to Print Preview to view the report exactly as it would appear on paper. This functionality is provided in all report viewers and designers. True printing through the ASP.NET and HTML5 viewers and Silverlight native printing capabilities are also supported. Telerik Report Server ensures smooth integration into your application by supporting themes and skinning for all its report viewers. You can choose to use the predefined themes, or create a new one. Native support lets you leverage one of the most popular databases, configuring its connection either directly in report definitions or using named data connections, registered in Report Server. ODBC provides you connectivity with many databases through a common interface, using third party drivers. Telerik Report Server can use virtually any compatible ODBC Data Source Name (DSN) and fetch data from a database that isn’t natively supported. If you don’t need real-life data, you can use the CSV data source. It’s very convenient for creating a quick report example that utilizes mockup data. This feature lets you expose your specific Business Objects, declared in Report Server domain, using the ObjectDataSource component.